Gilles Petersen is on hand to introduce this hotly anticipated event, the quickest to sell out in this year’s EFG London Jazz Festival. Both tonight’s featured acts have enjoyed a meteoric ascendancy in fortunes in 2015, but in all other respects they couldn’t be more different. Gogo Penguin are first on; set up to the rear of the stage to allow room for Lynne paige’s specially commissioned dance piece, their onstage presence is a model of British reserve until bassist Nick Blacka’s interjections add some bluff northern charm. ​They’re previewing material from their forthcoming Blu Note release; further explorations of their signature formula of minor key vamps and club culture-derived grooves, enlivened with the occasional ingenious time-signature twist. The arrangements are carefully plotted, with a minimum of improvisation, relying on textural variation rather than thematic development; the sound works well in the Barbican’s rather austere setting. Paige’s eight-strong troupe provide a well-conceived visual enhancement, effectively synchronised and delivered with a smiling panache, though the choreography perhaps missed an opportunity to reflect the music’s club roots with some more street-dance elements. Reserve isn’t really in Kamasi Washington’s repertoire tonight, either musically or visually. Resplendent in flowing robes and rasta hat, he leads his crew onstage - among them, two drummers, an afro-haired diva, a colourfully attired trombonist, a keytar-wielding pianist and a bassist twirling his bow like a gunslinger beneath a Huey P. Newton beret. After a solemn opening they crash into a spectacular, full-on assault of old-school psychedelic jazz. The leader spirals away into a scalding solo, twin drums pounding and churning behind him, his tone crystal clear, louder and more biting than on his recent sprawling triple-CD release. To compensate for the absence of the mighty strings and choir arrangements on the record, tracks are extended or twisted into funky breakdowns, while protracted solo features for moog and Miles Mosely’s heavily effected bass add to the glorious chaos that evokes the generous, anything-goes spirit of the early 70s. A feature for Kamasi’s dad Rickey on flute and vocalist Patricia Quinn’s beautifully sung tribute to his grandma both provide a respite from the relentless energy, and underscore that this is a family affair - most of the band have known each other since childhood, and the vibe on stage is notably warm and inclusive, with even the inevitable drum battle between Tony Austin and virtuoso Ronald Bruner executed in a spirit of friendly rivalry. 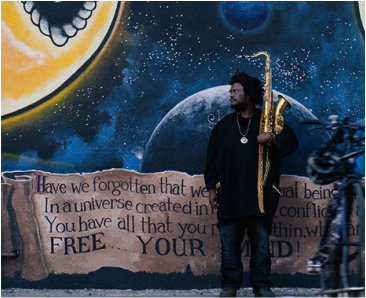 Kamasi himself exudes a mix of goofy humility and cool self-confidence. “We’re going to send you home with the best sound you ever heard in your life” he declares. The band were due to play in Paris the next day, and he dedicates ‘every note we play tonight’ to the beleagured city. Instead they are playing another London show in the Scala; a theatre with a mix of seated and standing might be a better place to appreciate this show, high on volume, groove and grand gestures but not too concerned with subtlety. Judging by the crowd’s ecstatic response, tickets will be snapped up - it’s been a long time since a project has come along that’s so firmly rooted in the deep jazz tradition, yet presents with such an unapologetic swagger.